Wholesome goodness. I think it's something we can all believe in. Look around you and you'll see that, while everyone is striving for it, we often fall short of the mark. Take apple pie, for instance. One may say "American as apple pie", but we all know America has lost a great deal of it's wholesomeness (if one is to assume that it was ever wholesome in the first place). The question is what kind of America do we want? Which kind of apple pie do we choose? A close examination of the leading apple pies on the market today reveals how woefully out of touch America is with basic wholesome goodness values. What passes for "old fashioned" or "homestyle" today? Virtually everything we eat in America today is a frightful facsimile of something wholesome and good. Apple pie, pancakes, bread, butter, gravy, grilled cheese, saurkraut, pickles and much much more. Even as the USDA uses language like "environmentally friendly" and "sustainability", as the FDA uses words like "wholesomeness", their actions tell quite a different story. We see a pattern of protecting corporate interests instead of protecting our health. With this in mind, we created Wholesome Goodness Productions to make the documentary, Fed Up! 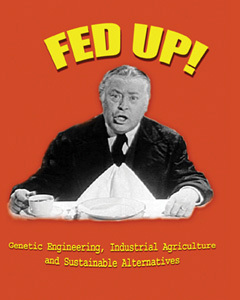 Genetic Engineering, Industrial Agriculture and Sustainable Alternatives. Fed Up! was completed in 2002 and released on DVD in 2004. Other projects are in the works. Check back soon for an update.